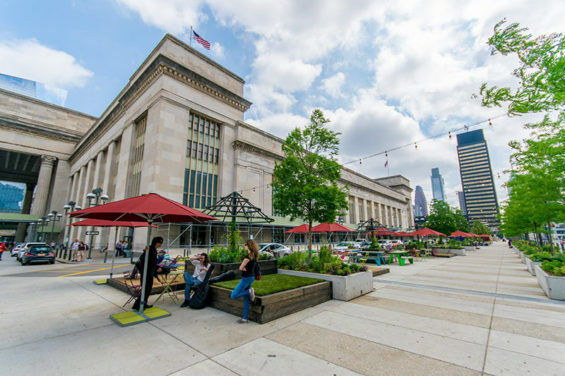 Groundswell Design Group was brought on by Philadelphia’s University City District to redesign The Porch, a public space located next to 30th Street Station, Philadelphia’s main train station and the second busiest station in the United States. 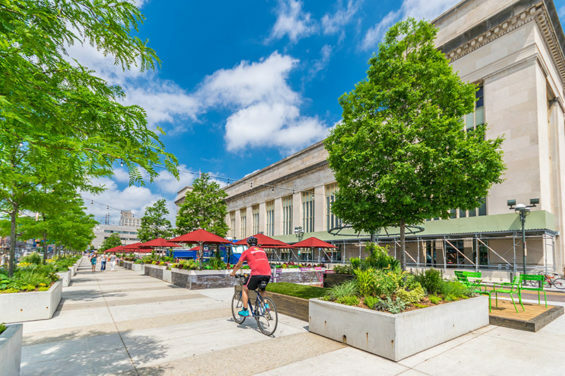 With 18,000 workers within a five-minute walk, and 16,000 people passing through the site daily, this former parking lot sits nestled between the grand colonnades of 30th Street Station and four lanes of traffic on Market Street. 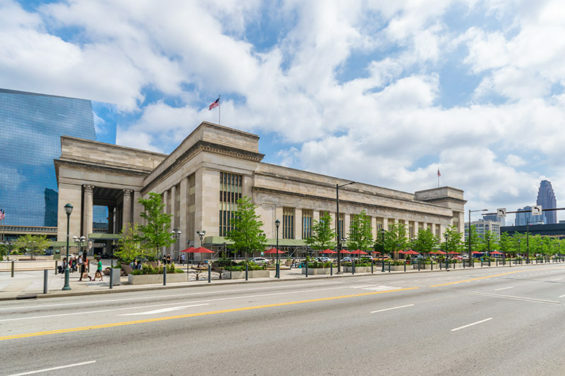 The Porch ultimately acts as the station’s gateway to Center City Philadelphia and University City. 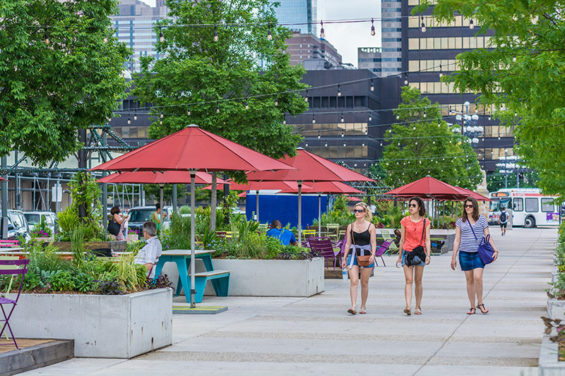 The Porch was Philadelphia’s first “lighter, quicker, cheaper” public space, and involved simple, cost-effective, and fully detachable elements. After a year of operating the space and studying user behavior, additional elements and programming were introduced in order to increase total number of users and time spent on site. 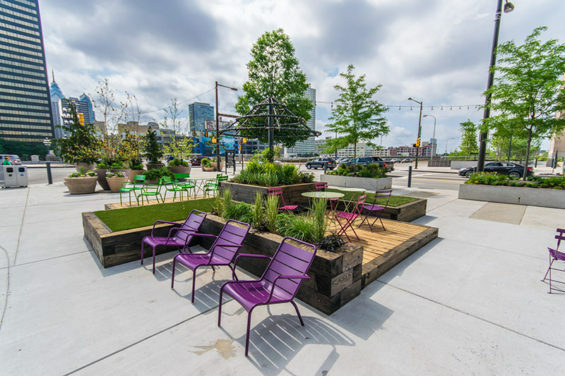 Groundswell designed the space with a series of dynamic parklet ‘stacks’ where each cluster consists of three different tiered platforms: decking, turf, and planters. 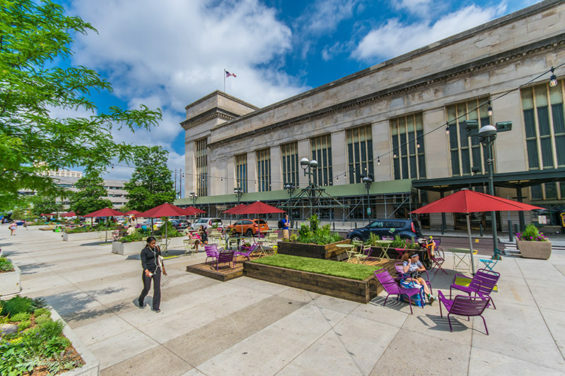 Colorful tables and chairs are arranged on the traditional porch decking platforms, turf areas offer opportunities to lay out and lounge in the sun, and raised planter beds are furnished with reclaimed steel umbrella trellises covered in vines, a sort of green homage to the traditional porch umbrella. 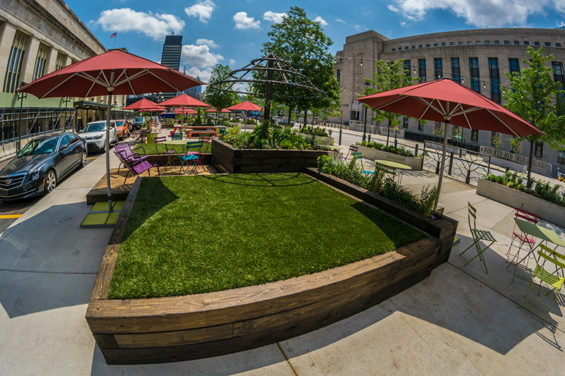 Scattered throughout the space are colorful porch swings and a one of a kind oversized dominoes set, for playing or seating, which bring to life elements of summer fun in the middle of the city. Overhead festoon lighting adds charm and vitality to the space after dark and helps increase site usage at night and on weekends. 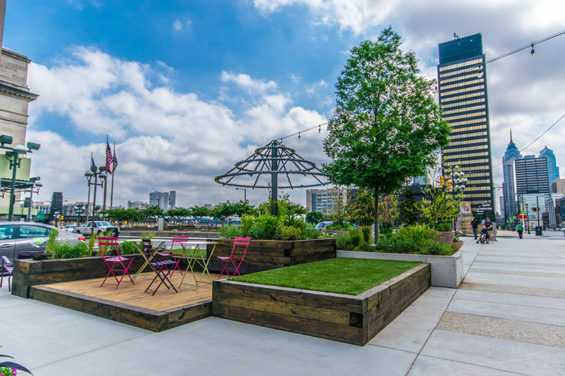 Permanent programming can be found on the eastern portion of the space activated through a 3,000 square foot beer garden stanchioned off with a rustic movable wooden planter system. One of the goals of The Porch was to utilize local artisans and craftsmen to custom build every facet of the project. It was important to Groundswell that the Philadelphia community have complete ownership and stewardship of the space. 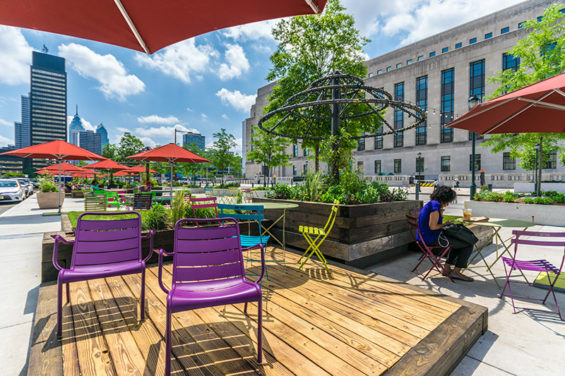 Everything from the reclaimed patina metal partition screens along Market Street to the custom colorful concrete top picnic tables was locally fabricated. The Porch was designed with a simple, cost-effective model and initially only included fully removable elements. 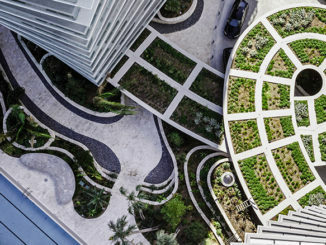 Additionally, Groundswell worked with the existing infrastructure of the space and added unique enhancements, all while keeping under strict weight and install restrictions due to burrowed out train tracks underground. 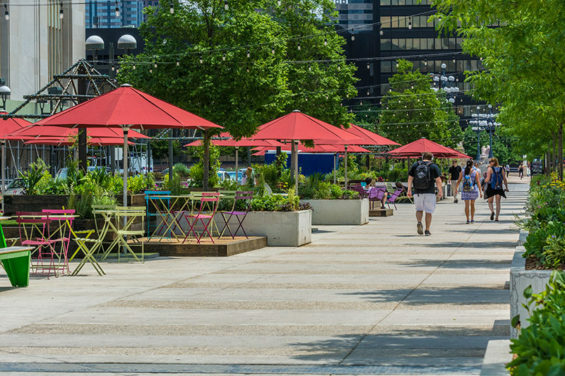 Through strategic planning and generous grant money from the John S. and James L. Knight Foundation, Knight Arts Challenge Grant; Groundswell Design Group and University City District were able to expand upon a great public space. Now that the Porch has been well-established as a popular outdoor hangout, new permanent elements will be introduced to complement the existing plants and furniture.